Beyond Beginning Design Workshop – Inspired by Artwork – WAIT LIST Only! Creating a floral arrangement inspired by a work of art is a fun and unique way to develop your design skills, because the Principles and Elements in Floral Design are the same as in Fine Art. This BB session will offer new ways to sharpen your discerning ‘eye’. In this session, you’ll create a design inspired by an assigned painting, just as if you were at a museum. 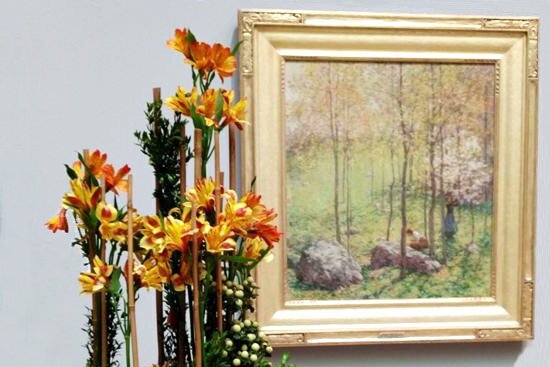 Here in Connecticut, the Florence Griswold Museum, Old Lyme, New Britain Museum of American Art, and the Wadsworth Atheneum, Hartford sponsor such events. You’ll receive your assignment by e-mail. Flowers and foliage will be provided; you bring a container, and any other components you might want to use. To open the session, a power point presentation of Museum designs will start your creative flow. The instructor of this session, Trish Manfredi, recieved the People’s Choice winning vote for her design in 2013 at Wadsworth. Suggested reading: The Fine Art of Flower Arranging : A Garden Club of America Book by Nancy D’Oench (who’s from Connecticut). It’s available from a number of libraries; you could get it by inter-library loan. It’s also available at a reasonable cost on Amazon. The $35 cost for this session does not cover the container. You bring one that you think works with the assigned painting. (The design pictured is not the design that will be made). Open to all FGCCT Members.